Dartmoor National Park Authority (DNPA) have published their final draft of the plans for the site and although none of the buildings are shown as being destroyed, a spokesman from DNPA has been quoted as saying “it is up to the developer whether to conserve or demolish the buildings” A copy of the plans can be found at www.dartmoor-npa.gov.uk/planning/pl-forwardplanning/masterplans-and-development-briefs/ashburton-masterplan. Whilst some might not have the ambition of saving the station for future generations to enjoy but there is current group of youngsters (and young-minded seniors) would like to say that at least we tried our best! If only as a Bovey Tracy style heritage centre or museum? Tea Room and Café? Or even a Midsommer Norton style demonstration line? Any one of these would be a great attachment to the current offering of the SDR. Many of you will be aware, our ’bus already runs to Ashburton on gala days and very popular it is too! 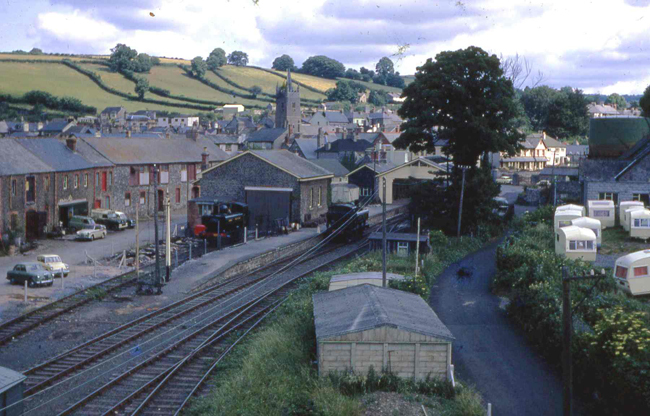 Ashburton has always seemed to embrace the railway far greater than Buckfastleigh has ever done. Maybe if we were to show an interest once again they would rather support us than a Supermarket and housing development? The choice of Heritage and tourism could be far better received than corporate development and over population. A Facebook group was created a while ago and named Friends of Ashburton Station. The group now has 162 members and has become a forum to share photos and thoughts of the station site. It is well worth a look – https://www.facebook.com/groups/ashburtonstation. There is a public meeting to be held in Ashburton Town Hall at 7pm this Thursday 13th November. This meeting will be an opportunity to discuss the second draft of the Masterplan. Attendance from supporters of a railway based scheme would be most encouraging. Consultation closes for the development on the 12th December 2014.